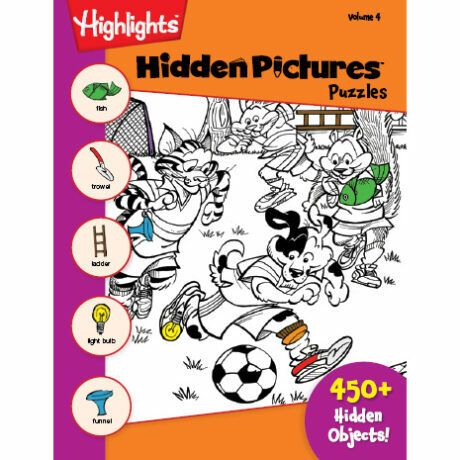 These classic puzzles, published by Highlights for more than 65 years, are both educational and fun. Children will increase visual perception and build vocabulary while delighting in the adventures of whimsical animal characters and kids just like them. Highlights is dedicated to helping children grow in basic skills and knowledge, in creativeness, in ability to think and reason, in sensitivity to others, in high ideals and worthy ways of living – for children are the world’s most important people™. 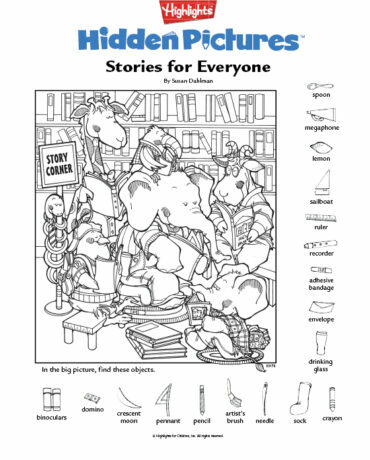 Some hidden objects are embedded within the line drawing of the illustration. Others may be hidden in plain sight – disguised to look like different objects that fit the context of the illustration. In black-and-white Hidden Pictures, it’s often best to look for basic shapes of an object.